Astronomers have detected what looks like auroral emission on an ultra-cool star. 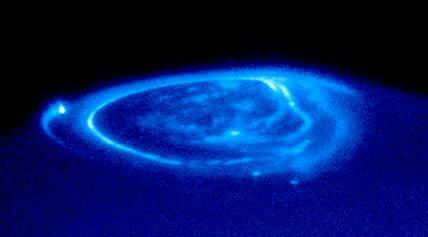 Every magnetized planet in the solar system has auroras. You don’t even need a global magnetic field — Mars has auroras, too. These auroras arise when electrons are dumped (via one magnetically channeled process or another) into the planets’ upper atmospheres, exciting atoms there and inciting them to emit photons. They glow at various wavelengths, including optical and radio, depending on the gas’s makeup and the energy of the invading electrons. Astronomers have also seen signs of auroras on ultra-cool dwarfs (UCDs), the runts of the stellar family. UCDs occupy a dubious region of stellar classification: they include both the least massive stars and failed stars called brown dwarfs, which in turn lie somewhere between a star and a planet. Several UCDs emit periodic, aurora-esque radio signals, and a few even show signs in optical wavelengths. Now, Gregg Hallinan (Caltech) and colleagues report they’ve detected these telltale radio and optical variations simultaneously from a UCD called LSR J1835+3259. This object is an M8.5 star, right at the transition point between stars and brown dwarfs. The team combined observations from the Very Large Array, the 5.1-meter (200-inch) Hale Telescope at Palomar, and one of the 10-meter Kecks on Mauna Kea. They found clear, periodic emission in all their observations — at radio wavelengths of several gigahertz and optically at the distinctly red wavelength called hydrogen-alpha — with the period matching the dwarf’s 2.84-hour rotation period. (Yes, that’s really fast: this object is about the same size as Jupiter but spins more than three times as quickly.) That suggests the auroral emission is rotating in and out of view as the dwarf star spins. The emission also seems to all come from the same region in the dwarf’s lower atmosphere, near its “surface,” or photosphere. And since the emission is persistent, it appears that a magnetically controlled stream of electrons is regularly being dumped into the star’s lower atmosphere to create the auroral feature. But how these electrons make their way into the atmosphere is an open question. On Earth, they’re introduced thanks to the interaction of our planet’s global magnetic field and the magnetized solar wind; on Jupiter, they’re in part due to the planet’s electromagnetic interaction with its volcanically active moon, Io. It does seem that the dwarf star’s rapid rotation is involved, but for now that’s all the astronomers can say. Additional, careful observations could pinpoint the location of the emission on the star, which would help narrow down the options. One curious speculation: the authors note that we’ve also seen variable emission at infrared wavelengths from brown dwarfs. Astronomers interpret these variations as signs of weather. On LSR J1835+3259, it looks like the electrons added to the atmosphere by the auroral current might be affecting the atmosphere’s temperature and opacity. Maybe, the authors propose, the same electron delivery mechanism that powers auroras could drive extreme weather on brown dwarfs.